A new concept, Parental Intelligence, offers a parenting approach that may reduce stress by helping you form lasting relationships with your child or teen when problems are identified and resolved. Portrait of a young woman running her hands through her hair. Does your relationship with your child or teen contribute to your stress level? Do you end up with headaches, muscle tension, fatigue, stomach upset, or sleep problems because of your worry about your child? Do you experience anxiety, restlessness, poor concentration, irritability or depression and other symptoms of stress after going at it negatively with your teenager? One major source of stress can be found in your parent-child relationship. 1. When you see an unwanted behavior, begin Stepping Back. This means think before you act. Pause, be nonjudgmental, set aside any assumptions, and begin the process of learning how to be a "meaning-maker." It's counter-intuitive not to act immediately, but this actually calms everyone down and gives you time to collect yourself. When your child sees you are calm, he calms,too. 2. Begin Self-Reflecting. When you self-reflect, you notice how you feel when the troubling behavior is going on. Are you worried, angry, scared, confused? These feelings may clue you into more about the problem at hand. 3. Begin Understanding Your Child's Mind and Understanding Your Child's Stage of Development by spending more time with your child. Hang out casually. This will give you and your child or teen time to chat randomly. This often leads to new information about your child's life. 4. Try to be a little less demanding of your child, so he begins to confide more easily in you. As he trusts you, he may share even more. 5. When your child speaks, do not interrupt. If she pauses, wait it out. Allow for pauses and silences in conversations. Don't draw conclusions or offer solutions, just ask for more: "Can you tell me more about that?" 6. If your child is young, spend more time playing and drawing together. Notice what she draws. It may be about what is troubling her. 7. Watch T.V. or videos with your child and discuss the feelings of the characters. Discussing the characters' feelings rather than your child's or teen's feelings is easier than talking about oneself. However, inevitably the child is talking about the kinds of feelings she knows about and experiences. You get to know her inner world better. 8. Begin to share your own thoughts about the feelings of the characters on the videos or in books you read. Make "feeling language" part of your conversations and lives. 9. You have begun to Understand Your Child's Mind. This is the crux of Parental Intelligence. Children and teens think differently than adults. We need to learn how they think, imagine, feel, and construe situations. If we are patient, we learn how they draw often erroneous conclusions that we can correct or modify when they trust us because we've spent so much time getting to know them. 10. Become involved in your child's favorite activities without judging their performance. Just enjoy the experience. Enjoy each other. 11. Get to know your child's friends. Encourage sleep-overs and taking them to the movies. Whatever it takes to show your child you care about their friendships. 12. Try doing some new things with your child. Ask them for their ideas before you offer your own. Take your teen out to lunch. Take your child to a sports event. Cook together. 13. During this process of getting to know your child better, you will most likely find out what is bothering them that led to that unwanted behavior. That is, the meaning of the behavior starts to surface. 14. You discover the behavior is a form of communication. The behavior sends a message. Your job is to decipher the message which you are more prepared to do now that you know your child or teen so well. 15. Once you understand that the behavior was a communication, you make some new discoveries. Your son hit his brother because he thought you loved him more. He thinks this because his brother is better at sports than he is and he believes this is very important to you. Your daughter is embarrassed to tell you her boyfriend broke up with her and that's why she's yelling at everyone out of her frustration and disappointment. Your daughter is hiding in her room all the time because she failed Spanish and doesn't want you to disapprove of her and think she's a "loser" which is how she feels about herself. Your son is having temper tantrums because he hasn't made friends yet in his first year in middle school at the same time that his favorite brother went away to college. He's terribly sad but has outbursts instead of letting you know that. The behavior that puzzled you is now understood as a beacon to the real underlying reasons that your child shares with you because of the trust you've built up. 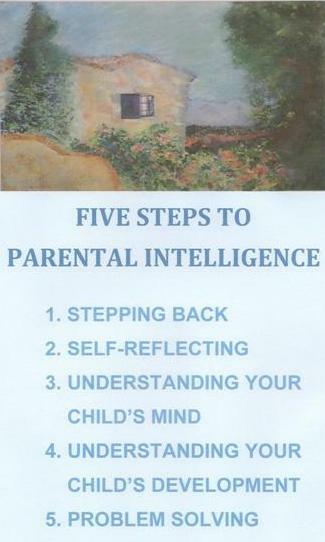 Using your Parental Intelligence, misconceptions are cleared up, problems are solved, misbehaviors are understood and vanish. You've strengthened your parent-child relationship--and--reduced stress in the house! Whoa! Laurie Hollman, Ph.D. is a psychoanalyst with a new book, Unlocking Parental Intelligence: Finding Meaning in Your Child's Behavior, found on Amazon, Barnes & Noble, Familius and wherever books are sold.